The Oresund Bridge (Danish Oresundsbroen, Swedish Oresundsbron, joint hybrid name Oresundsbron) is a combined two-track rail and four-lane road bridge across the Oresund strait. 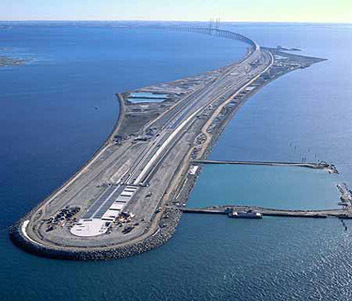 The bridge-tunnel is the longest combined road and rail bridge in Europe and connects the two metropolitan areas of the Oresund Region: the Danish capital of Copenhagen and the Swedish city of Malmö. The international European route E20 runs across the bridge, as does the Oresund Railway Line. In 1991 the Denmark and Swedish governments agreed to build a bridge to connect the two countries across Oresund. Later that year the two parliaments ratified the agreement and scheduled the design to be completed by 1994. The 16 km long Oresund link between Sweden and Denmark is now complete. At 6 am on August 14, 1999 the final section of the Oresund bridge was placed in position by the floating crane, “Svanen”. Six hours later, Crown Princess Victoria of Sweden and Crown Prince Frederik of Denmark met on the bridge to mark the fact that Denmark and Sweden are linked once more – 7,000 years after the Ice Age when they were landlocked. The project opened to traffic during the summer of 2000. The Oresund Bridge is the world’s longest single bridge carrying both road and railway traffic. 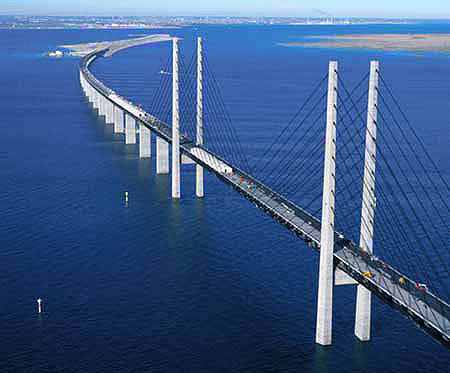 In the design full advantage was taken of repetition by composing the major part of the bridge of identical spans. The high bridge with its record-breaking cable-stayed span of 490m is designed to harmonize both structurally and aesthetically with the approach bridges. In the construction phase the on-site activities were completed in just 2 1/2 years due to an extensive use of prefabrication and erection of large units.